Your use of this website (hereinafter the “site”) constitutes your unconditional acceptance of these Terms and conditions of use. If you do not agree with any of these Terms and conditions of use, do not use this site. Bath Depot and/or Bain Dépôt reserves the right to update or modify these Terms and conditions of use at any time without prior notice. When you, the user use the site, Bath Depot and/or Bain Dépôt grants a limited revocable license to you to use the site solely on behalf of yourself or your organization or company for personal, non-commercial use and solely in compliance with these Terms and conditions of use. You may download or copy the contents and other downloadable materials displayed on the site for your personal use only. No right, title or interest in any downloaded materials or software is transferred to you as a result of any such downloading or copying. This license expressly prohibits you, without limitation, from reselling the site or any portion thereof or the services offered by Bath Depot and/or Bain Dépôt, making any derivative work of the site, collecting or using e-mail addresses or other information, ratings or listings, or extracting or mining any data whatsoever. You may use this site for legitimate informational and shopping purposes only. You may not harm the site in any way or otherwise use the site in any improper manner, including, but not limited to hacking into the site’s systems, spoofing or faking e-mail headers or slowing or stopping the functionality of the site. In the event that you register and/or purchase product through this site, you agree to provide true, accurate, current and complete information about yourself as prompted by the registration form. If you provide any information that is untrue, inaccurate, not current or incomplete, or Bath Depot and/or Bain Dépôt suspects, for any reason, that such information is untrue, inaccurate, not current or incomplete, Bath Depot and/or Bain Dépôt, in its sole discretion, has the right to suspend or terminate your account and refuse any and all current or future use of the site by you. You will create a password and account designation upon completing the registration process. You are responsible for maintaining the confidentiality of the password and account, and are fully responsible for all activities that occur under your password or account. You agree to immediately notify Bath Depot and/or Bain Dépôt of any unauthorized use of your password or account or any other breach of security, and ensure that you exit from your account at the end of each session. Bath Depot and/or Bain Dépôt will not be liable for any loss or damage arising from your failure to comply with this paragraph. References on this site to any name, marks, products or services of third parties or hypertext links to third party sites or information are provided solely as a convenience to you and do not in any way constitute or imply an endorsement, sponsorship or recommendation by Bath Depot and/or Bain Dépôt regarding the third party information, product or service. These sites are maintained by third parties over whom Bath Depot and/or Bain Dépôt exercises no control. Bath Depot and/or Bain Dépôt has not reviewed all sites linked to this site and Bath Depot and/or Bain Dépôt expressly disclaims any responsibility for the content, the accuracy of the information, and/or the quality of products or services provided by or advertised on these third-party web sites. If you decide to link to any such third party site, you do so at your own risk. Bath Depot and/or Bain Dépôt does not warrant that the site of the materials contained therein will be accurate, reliable or error-free, that defects will be corrected, or that the site or the server that makes it available is free of viruses or other harmful components. Bath Depot and/or Bain Dépôt cannot be held responsible for errors and omissions in any catalog, product advertising material or site, any glossaries contained within the site or any supplemental material. Material on the site may contain technical inaccuracies or typographical errors and may be changed or updated without notice. Bath Depot and/or Bain Dépôt will not be liable or responsible for any such inaccuracies, errors, changes or updates. All information, ideas, suggestions or other communications you transmit to Bath Depot and/or Bain Dépôt concerning the materials contained in this site shall be on a non-confidential basis. By transmitting any suggestions, information, material, or other content to Bath Depot and/or Bain Dépôt, you automatically grant Bath Depot and/or Bain Dépôt the royalty-free, perpetual, irrevocable, non-exclusive right and license to use, reproduce, modify, adapt, publish, translate, create derivative works from, distribute, redistribute, transmit, perform and display such user content (in whole or part) worldwide and/or to incorporate it in other works in any form, media, or technology now known or later developed for the full term of any rights that may exist in such user content. Further, Bath Depot and/or Bain Dépôt is free to use any ideas, concepts, know-how, techniques, and suggestions contained in any communications you send to this site without compensation to you and for any purpose whatsoever, including but not limited to creating, manufacturing, and marketing products and/or services using such information. You expressly represent and warrant to Bath Depot and/or Bain Dépôt that you will use this site, and any products purchased from Bath Depot and/or Bain Dépôt, in accordance with all applicable local, provincial, state, national and international laws, and in accordance with these Terms and conditions of use. You agree to defend, indemnify, and hold harmless Bath Depot and/or Bain Dépôt and all of its respective employees, agents, directors, officers, proprietors, partners, representatives, shareholders, servants, attorneys, predecessors, successors, assigns, agents, licensors, and third party providers to the site from and against any and all claims, proceedings, damages, injuries, liabilities, losses, costs, and expenses (including reasonable attorneys’ fees and litigation expenses), relating to or arising from (a) your use of the site; or (b) any breach by you of these Terms and conditions of use. You hereby waive and release Bath Depot and/or Bain Dépôt from all rights of contribution or indemnity to which you otherwise may be entitled. Bath Depot and/or Bain Dépôt reserves the right to assume, at its sole expense, the exclusive defence and control of any matter subject to indemnification by you, in which event you will fully cooperate with Bath Depot and/or Bain Dépôt in asserting any available defences. This is provided on an “as is” and “as available” basis. Bath Depot and/or Bain Dépôt expressly disclaims all representations and warranties of any kind, either express or implied, regarding the operation of the site or the information, content, materials, merchandise, or products included or displayed on this site or any products offered or available through the site or catalog or in stores, but does not apply to any product warranty offered by Bath Depot and/or Bain Dépôt. If for any reason you are not completely satisfied with your purchase, simply return it to Bath Depot and/or Bain Dépôt within 7 days of purchase for a full credit or 30 days for an exchange or credit note. The item must be in its original packaging (damaged boxes will engage a 30% restocking fee). Return shipping charges must be prepaid by you and you must insure the shipment or accept the risk of loss or damage during shipment. All items can be returned free of charge at any Bath Depot and/or Bain Dépôt or Bain Dépôt store. All warranty materials and the original receipt must be included with any returned purchases. The item must not have been damaged or altered in any way. Return policy for clearance and demo items: all sales are final. Bath Depot and/or Bain Dépôt makes every effort to display as accurately as possible the colours of its products that appear on the Site. However, as the actual colours you see will depend on your monitor, Bath Depot and/or Bain Dépôt cannot guarantee that your monitor’s display of any colour will be accurate. While Bath Depot and/or Bain Dépôt strives to provide accurate product and pricing information, pricing or typographical efforts may occur.  Bath Depot and/or Bain Dépôt cannot confirm the price of an item until after you order. In the event that an item is listed at an incorrect price or with incorrect information due to an error in pricing or product information, Bath Depot and/or Bain Dépôt shall have the right, in its sole discretion to refuse or cancel any orders placed for that item. In the event that an item is mispriced, Bath Depot and/or Bain Dépôt may, at its discretion, either contact you with instructions or cancel your order and notify you of such cancellation. Prices and availability are subject to change without notice. Please note that there may be certain orders that Bath Depot and/or Bain Dépôt is unable to accept and must cancel. Bath Depot and/or Bain Dépôt reserves the right, at its sole discretion, to refuse or cancel any order for any reason. Some situations that may result in your order being cancelled include limitations on quantities available for purchase, inaccuracies or error in product origin information, or problems identified as part of credit and fraud avoidance. Bath Depot and/or Bain Dépôt also may require additional verification or information before accepting any order. Bath Depot and/or Bain Dépôt will contact you if all or any portion of your order is cancelled or if additional information is required to accept your order. If your order is cancelled after your credit card has been charged, Bath Depot and/or Bain Dépôt will issue a credit to your credit card in the amount of the charge. The receipt of an e-mail order confirmation does not constitute the acceptance of an order or a confirmation of an offer to sell. Bath Depot and/or Bain Dépôt reserves the right, without prior notification, to refuse service to any customer. Bath Depot and/or Bain Dépôt reserves the right to limit the quantity of items purchased per person, per household, or per order. These restrictions may be applicable to orders placed by the same Bath Depot and/or Bain Dépôt account, the same credit card, and also to orders that use the same billing and/or shipping address. Bath Depot and/or Bain Dépôt will provide notification to the customer e-mail and/or billing address should such limits be applied. Bath Depot and/or Bain Dépôt also reserves the right to prohibit sales to dealers. For all the details regarding shipping and delivery, please refer to the "Shipping & delivery" page. You are responsible for sales tax and any other taxes or governmental fees associated with your order. The charges stated in the order or any invoice shall be inclusive of all duties, levies or any similar charges and shall exclude GST, QST, PST, HST or other VAT or equivalent sales or use tax (each, a “VAT”). Unless otherwise specified in writing by Bath Depot and/or Bain Dépôt, you shall pay all freight, insurance, and taxes (including but not limited to import or export duties, sales, use, value add, and excise taxes). Neither Bath Depot and/or Bain Dépôt nor its parents, subsidiaries or affiliates nor any of their respective employees, agents, directors, proprietors, partners, shareholders, attorneys or any representatives will be liable for an indirect, incidental, special, punitive or consequential damages arising directly or indirectly from any use of the site or the catalog, products available or purchased through the site, the inability to use this site, the information contained on the site, products available or purchased through the site or transactions conducted, even if Bath Depot and/or Bain Dépôt has been advised of the possibility of such damages or losses. All materials contained in the site, including without limitation all images, text, illustrations, designs, icons, photographs, programs, and written and other materials that are distributed with this site and all the products available on the site, are the intellectual property owned, controlled or licensed by Bath Depot and/or Bain Dépôt, its affiliates or are owned by third parties and appear in the site with the permission of their respective owners. Accordingly, such materials are protected by law, including but not limited to Canadian and United States copyright, patent, trade secret, trade dress and trademark law, as well as other state, national, and international laws and regulations. Bath Depot and/or Bain Dépôt and its affiliates and licensors expressly reserve all intellectual property rights in all text, programs, products, processes, technology, content, and other materials that appear on this site. Except as otherwise expressly provided in these Terms and conditions of use, access by you to this site does not confer any license under any of Bath Depot and/or Bain Dépôt’s or any third party’s intellectual property rights. The compilation of all content on this site is the exclusive property of Bath Depot and/or Bain Dépôt and is also protected by Canadian and United States and international copyright law. You agree not to copy, modify, adapt, reproduce (except as noted above), publish, translate, distribute, transmit, display, reverse engineer, decompile, create derivative works from, sell or participate in the sale of, dissemble or in any way exploit any aspect of the site. Please be aware that Bath Depot and/or Bain Dépôt actively and aggressively enforces its intellectual property rights to the fullest extent of the law. Events beyond Bath Depot and/or Bain Dépôt’s control. The use of the internet is solely at your own risk and is subject to all applicable local, provincial, state, national, and international laws and regulations. While Bath Depot and/or Bain Dépôt has endeavoured to create a secure and reliable site, Bath Depot and/or Bain Dépôt and its affiliates are not responsible for the security of information transmitted via the internet, the accuracy of the information contained in the site, or the consequences of any reliance by you on such information. You must make your own determination as to these matters. Bath Depot and/or Bain Dépôt cannot guarantee that you will be able to access the site at all times or that the site will be secure, uninterrupted, or error-free, nor can Bath Depot and/or Bain Dépôt provide assurances that transactions will be completed properly. Bath Depot and/or Bain Dépôt is not responsible for failure to execute a purchase or technical problems that may hinder the efficacy of a purchase (including e-mail, transmission times or other delays). Bath Depot and/or Bain Dépôt shall not be liable for damages as a result of any delay or other failure of performance due to causes beyond their reasonable control including, without limitation, acts of God, acts by you or by any of your representatives or by any third parties, acts of military or civil authorities, fire or other casualty, strikes, lockouts, weather, epidemic, war, riot, terrorism, telecommunications interruptions or computer viruses. It is strictly prohibited to violate the security of the site, including, without limitation: (a) accessing data not intended for your use or logging onto a server or an account that you are not authorized to access; (b) attempting to probe, scan or test the vulnerability of a system or network or to breach security or authentication measures without proper authorization; (c) attempting to interfere with service to any user, host or network, including, without limitation, by submitting a virus to the site, overloading, flooding, spamming, or crashing; (d) sending unsolicited e-mail, including promotions and/or advertising of products or services; or (e) forging any TCP/IP packet header or any part of the header information in any e-mail or newsgroup posting. Actual or attempted unauthorized use of the site or violations of system or network security may result in criminal and/or civil prosecution. For your protection, Bath Depot and/or Bain Dépôt reserves the right to view, monitor, and record activity on the site without notice and without permission from you. This site is owned and controlled by Bath Depot and/or Bain Dépôt inc. (“Bath Depot and/or Bain Dépôt”) from its offices in Laval, Province of Quebec, Canada. Although this site can be accessed from other locations, by accessing this site, you agree that the laws and regulations of the Province of Quebec (and the laws and regulations of Canada, as applicable), without regard to conflict of laws, will apply to all matters relating to use of this site. In addition, any action or proceeding arising out of or related to these Terms and conditions of use or your use of this site may be brought only in the courts of the Province of Quebec. District of Laval, and you agree to and consent to the exclusive personal jurisdiction and venue of the courts the Province of Quebec. District of Laval. You are responsible for your own compliance with local laws regarding internet use and access. These Terms and conditions of use constitute an agreement that is effective until terminated by Bath Depot and/or Bain Dépôt at any time without notice. Bath Depot and/or Bain Dépôt may terminate your right to use this site immediately without notice to you if, in Bath Depot and/or Bain Dépôt’ sole discretion, you violate or fail to comply with any of these Terms and conditions of use. In the event of termination, you will no longer be authorized to access this site. The restrictions imposed upon you with respect to material copied or downloaded, and the disclaimers and limitations of liability set forth in the Terms and conditions of use, shall survive the termination of these Terms and conditions of use. These Terms and conditions of use constitute the entire agreement between you and Bath Depot and/or Bain Dépôt relating to the subject matter addressed herein. If any portion of these Terms and Conditions of Use is adjudged invalid or unenforceable by a court of competent jurisdiction, the remaining portions will remain valid, enforceable, and carried into effect. The Terms and conditions of use may be modified by Bath Depot and/or Bain Dépôt at any time on without prior notice, by posting such changes at the site. Modifications required by law or designated by Bath Depot and/or Bain Dépôt will become effective immediately. Your continued use of the Site following notice of any such modification will be conclusively deemed your unconditional acceptance of the revised Terms and conditions of use. If any such revision is unacceptable to You, You should discontinue use of the site immediately. A printed version of these Terms and conditions of use and of any notice given in electronic form will be admissible in judicial or administrative proceedings based on or relating to these Terms and conditions of use to the same extent and subject to the same conditions as other business documents and records originally generated and maintained in printed form. The failure of Bath Depot and/or Bain Dépôt to act with respect to a breach of this agreement by you or others does not constitute a waiver and shall not limit Bath Depot and/or Bain Dépôt’s rights with respect to such breach or any subsequent breaches.